Alex Smith takes on the complex and demanding task of finding a do-it-all boat for a mixed life of Euro cruising. 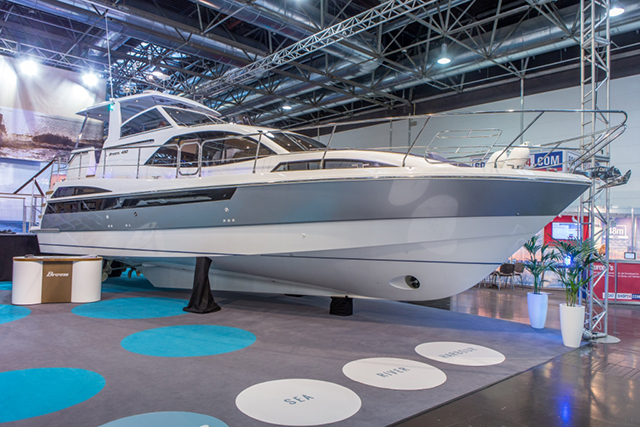 The steel Andante 438 OC is a perfect European cruiser. 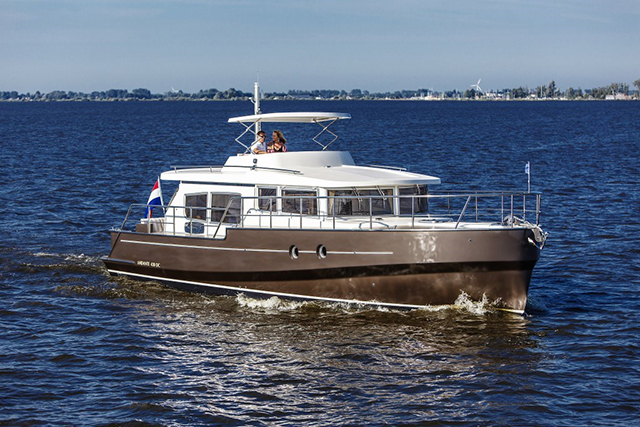 The new Andante 438OC from Dutch steel specialist Aquanaut is a usefully versatile boat. Conceived as “a cross between an open cockpit, a trawler and a top cockpit” cruiser, it uses an elevated second helm with a retractable hard top that keeps the air draft well within the limits. It also uses a particularly efficient form of displacement hull with a tapered bow and flat aft sections that should enable a huge cruising range at modest speeds of around six knots. However, for me, the AC (or aft cabin) model, which comes with a large aft steering position, three cabins and a pair of heads compartments, looks like a more generous and versatile arrangement – particularly as it costs exactly the same as this OC (Open Cockpit) variant. See the boat up-close with our Aquanaut Andante 438 OC First Look Video. The Privateer Trawler is also from The Netherlands. Again from the Dutch is this "compact" trawler from Privateer. Like the larger craft in the line, the 50 is essentially designed as a "little ship", with expansive liveaboard proportions built upon the basis of Privateer’s well-established multi-chine hull. 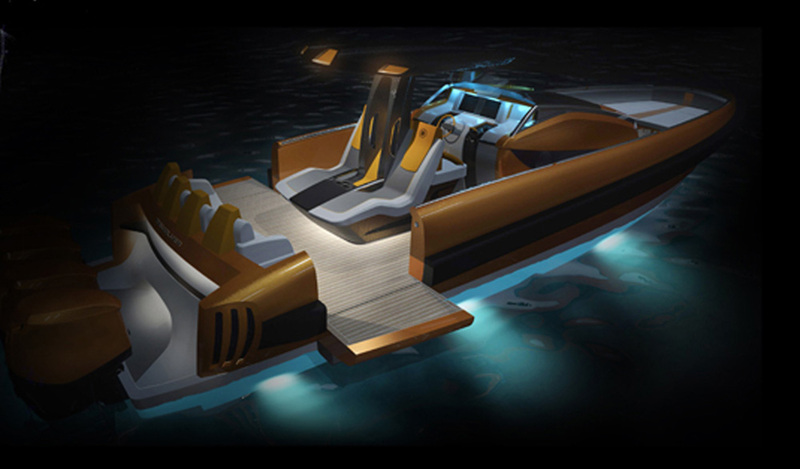 There is standing room of two metres throughout and there is also plenty of customisation potential built into the DNA of this 34-tonne displacement craft. For long-term cruisers and liveaboards, the full-beam master suite amidships is the most common layout solution. 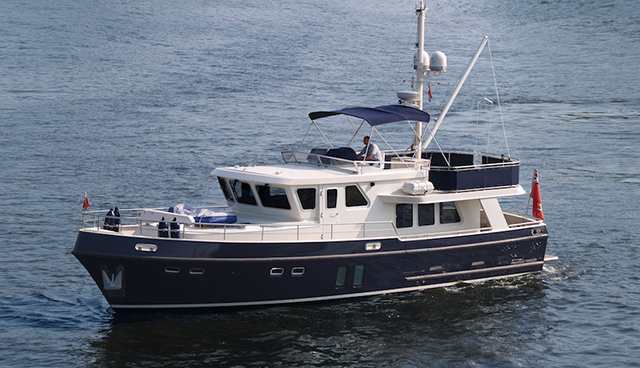 Privateer’s rather lovely Elegance 49 is also a tempting European cruiser option, but the extra seakeeping prowess of the big A-rated offshore trawler (not to mention its 16-foot beam) adds some useful extra versatility while remaining just on the safe side of our nominal inland parameters. 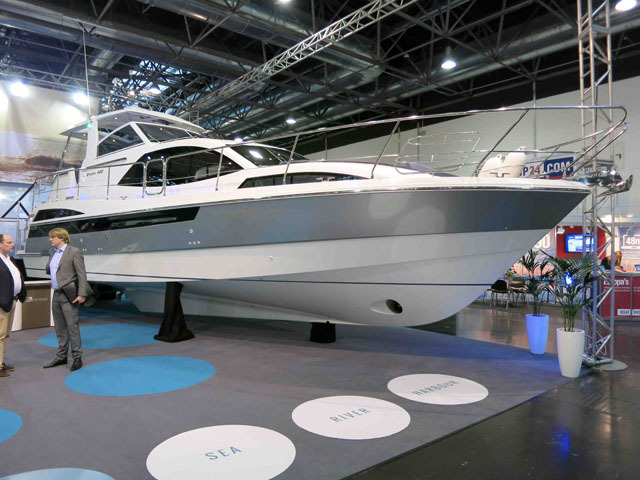 The Broom 430, which debuted at the Dusseldorf Boat Show in 2014 (see Broom 430 aft cabin cruiser video: first look) was designed and built with exactly this kind of pursuit in mind. Based around the company’s most popular semi-displacement hull, it is as content at sea as it is plying Europe’s inland waterways. Up top, a commanding but sheltered helm position offers the scale, the external space and the perspective of a flybridge but without the vertical elevation. The external arrangement also offers plenty of easy embarkation points and big lateral walkways for safety at sea. However, it’s inside that the 430 really excels, with an extended cockpit design, generating a huge, unbroken entertaining space from the aft cabin all the way forward to the lower-level galley. The aft cabin is by no means the brightest or most panoramic of its kind but with expansive internal space and that masterful upper deck (not to mention sleeping for up to six and engine options from 370 to 880hp) the 430 would make a very adept companion for a life of mixed European cruising. See a full review of the boat here. The Steeler Panorama has strikingly flat topsides. As the name of the Panorama Flatfloor 46 suggests, this award-winning vessel employs a level deck from bow to stern, with a huge section of internal floor space and panoramic views all round. 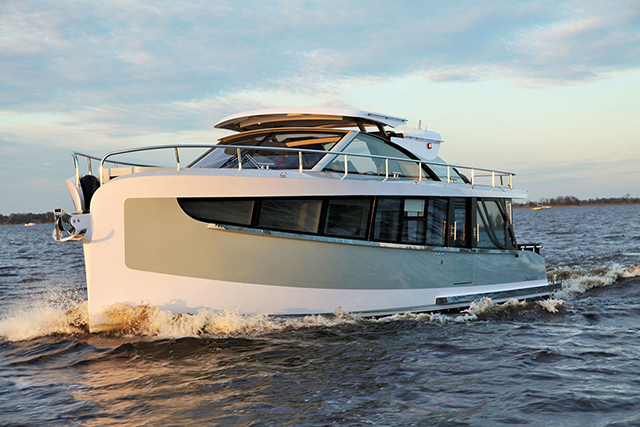 Designed in association with Vripack, it uses a steep bow, strikingly flat topside lines and a glass-intensive wheelhouse ‘dome’ with an electrically lifting cabriolet roof. Certainly, the straight bulkheads mean very modern (some might say ‘challenging’) looks, but that cube-like shape also means great headroom, better access to the shore and internal volume that seems to dwarf that of most 50-footers. Rather cleverly, if you fill the big central water tank, you can lower the clearance height by 12 cm to aid bridge clearance. 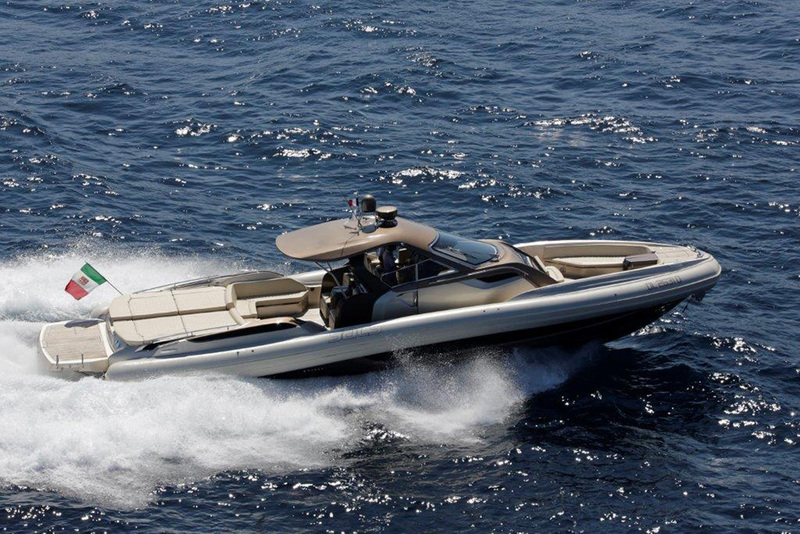 With twin Yanmar 6BY3 160hp engines you can expect a top end of 11 knots. That seems like plenty for most pursuits, but if you want some extra pace for faster offshore passages, then you should also check out Steeler’s line of aluminium-built Flatfloor craft. We’re staying in Holland for the last of our top five and we make no apologies for doing so. 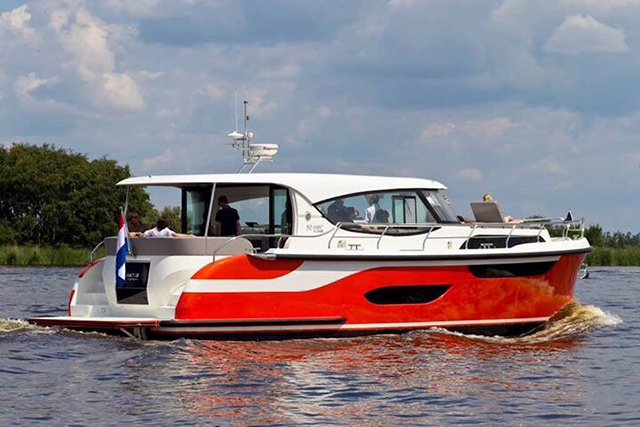 The Jetten 50 MPC (or Multi Purpose Craft) is a very modern interpretation of the European Cruiser and as the flagship of the Jetten Series. It holds nothing back. That 16-foot beam is worked hard, with a claimed 56 per cent more deck space than comparable 50-footers. With a fuel flow of around six litres per hour at a gentle five knot cruise, you could meander for an age on that 2,250-litre fuel tank. Of course, if your likely cruising grounds enable a loftier boat, the 50 MPC Fly (with an air draft of 4.87 metres) is one of the best examples of its type you are likely to see. But if the modernity of that happens to leave you cold, then the more traditional 58 AC from the Bommelaer range is a particularly effective solution.